The ability to deliver powerful presentations is essential not only for one’s success as an individual, BUT for the company as a whole! Picking up and applying world class tips, tools and techniques will help build the self -confidence of your staff, group, or employees, and improve their communication skills resulting in higher productivity and profit. is always about closing a sale – an idea, a proposal, a product, a service, yourself? Since speaking is a process that can be learned by doing, a series of 4/5 customized sessions, is preferable, since over time, the attendees and I can build relationship, connection, and consequently, their own increased self-confidence and trust in me. I can then share digestible proven presentation techniques over a period of time and evaluate their progress. your own outcomes, goals for your attendees??? my sense of humour and years as a comedic stage actress, fully understanding that: when people laugh, they relax, when they relax, they learn, and when they learn, they remember! 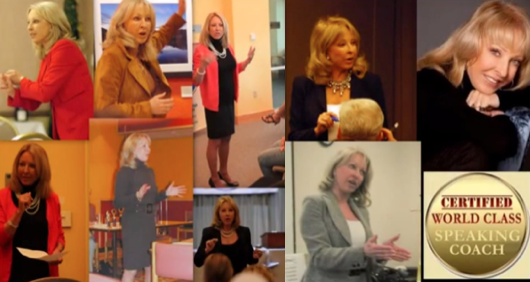 GROUP SPEECH CLASSES…Rave Reviews CONTACT ME!